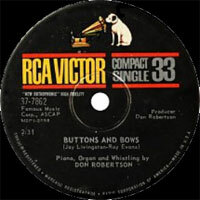 Chanteur, compositeur et pianiste US né Donald Irwin Robertson, le 5 Décembre 1922 à Pekin (Chine). 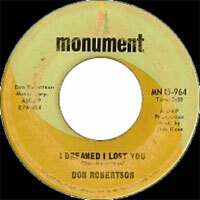 Don Robertson a composé de nombreuses chansons pour Elvis Presley. Il est mort le 16 Mars 2015. Donald Irwin Robertson was born in Pejing, China on December 5, 1922, his father was O.H. Robertson, a physician and medical scientist who was then head of the Department of Medicine at Peking Union Medical College. His mother, Ruth, was a talented pianist and poet/playwright who, upon noticing his interest in the piano, insisted he began formal lessons at the age of four. He began composing simple songs around seven years old. Moving back to the USA, he had to also learn how to play brass instruments as the school band did not have a piano. He joined the marching band, specializing in the trombone and tenor horn but did not forget his piano training as he played with local dance orchestras in Chicago. He was torn between following his father's medical career, as both his brothers, or following a career in music and he dropped out of the University of Chicago and landed a job as musical arranger at the radio station WGN, arranging for a trio of girls, the Brandt Sisters. After the war, he accompanied another girl trio, the Dinning Sisters to Los Angeles as their accompanist and arranger, marrying one of the trio, Lou Dinning. Along with his new wife, he made several demo recordings for publishers and songwriters and worked at Capitol records as a rehearsal pianist. 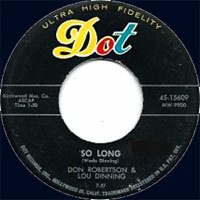 His career as a song writer began with the collaboration with Hal Blair about 1953, the following year, scoring his first major success when his song, "I Really Don't Want to Know," was recorded by Eddy Arnold. 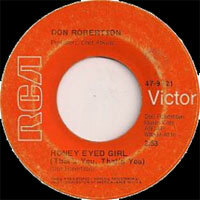 Also in 1954, Hank Snow's version of Robertson's song, "I Don't Hurt Anymore," was a big hit on the country charts and during this period, his songs were recorded by artists as diverse as Faron Young, the Chordettes, Les Paul & Mary Ford, and even Elvis Presley who sang his "I'm Counting on You" for his debut album in 1956, which led to Presley inviting him to his house one evening, a meeting from which followed Robertson accompanying Presley on the piano and organ on the soundtrack of It Happened at the World's Fair. 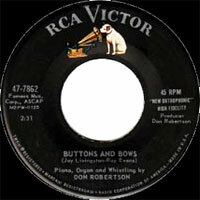 Robertson was interested in all genres of music from the symphonic recordings in his father's collection to hymns he had sung in the Chicago church choir. He was also a proficient whistler, although he did claim that he had been whistling all his life but never expected to ever do it professionally. "I am not proficient at it like some of the whistlers around who can whistle classical scores and bird calls, etc. I just happened to hit on a little tune that caught on." 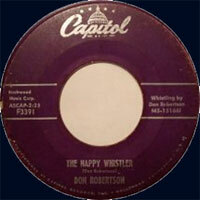 That little tune in question was "The Happy Whistler" which he took into the Top Ten of the singles chart as a solo recording in 1956. 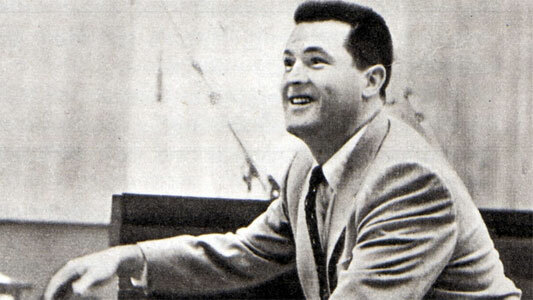 One of the biggest hits of 1960 was his song "Please Help Me I'm Falling," co-written by Hal Blair, which has since become a country music standard. Several of his songs went all the way to number one during the '60s including "Does My Ring Hurt Your Finger" by Charley Pride on the country charts in 1967 and Lorne Greene's recording of the cowboy song "Ringo" which hit the top of the pop charts in 1964. 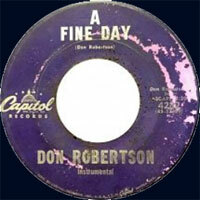 In 1967, Robertson's name was added to the Walkway of Stars at Nashville's Country Music Hall of Fame, and in 1972 he was inducted into the Nashville Songwriters Association's Songwriter's Hall of Fame. For many years he could be heard as the voice of Gomer the bear singing and playing the piano in the opening number of the Disneyland-Disneyworld Country Bear Jamboree exhibition. In the latter years of the 20th century, he has appeared with and accompanied Waylon Jennings, Billy Swan (of "I Can Help" fame), Johnny Cash, and Kris Kristofferson, and in 2003, EMI issued a CD of his songs, Songs for Elvis/And Then I Wrote Songs for Elvis. I Dreamed I Lost You / Pianjo!